There are currently 2 users and 1769 guests online. Talk about every man and his dog!!!! Couple of classic parking spots there too. My maverick is in there too , somewhere up the back . Was a club shoot for 4WD monthly , was in the Jan 2006 edition. I dont think tailor would stand a chance there with that lot! Yeah I remember reading about that in 4WD monthly. 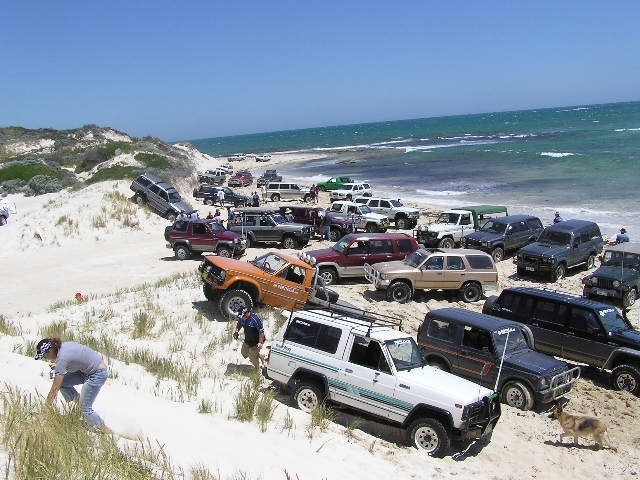 Some perth 4x4 club, can't remember the name... some blokes were getting some good air off the dunes from what I can remember. Some beaches might look like this, as Tailor/Muloway stocks cop a pounding??????? ?